In the West Kameng district of Arunachal Pardesh, mid-way on the Tezpur-Bomdila-Tawang road in a forest tract of 218 sq km lies the little-known Eaglenest Wildlife Sanctuary. From near anonymity, it has overnight become the focus of worldwide excitement for ornithologists. On May 25 this year Ramana Athreya, a radio astronomer and an ardent bird watcher from Pune, discovered an Indian bird species hitherto unknown to science. The count of species, which stood at 1,225 for India since 1948, has now moved up by one digit. In general, people are attracted to a bird either because of its brilliant plumage (the peacock) or its appealing song (the Blue Whistling Thrush). As far as the overall impact of colour is concerned, Ramana's discovery is so sublime that you can never have enough of it. Shades of red, black, flaming orange, yellow, brown, olive, grey, white, flesh pink and silver are deftly interwoven into a matrix, the ultimate in colour harmony. The news of the discovery became public only in mid-September because many exacting demands had to be met to provide evidence. Ramana has provided all save one. He was very wise not to kill the bird for a "full museum specimen". He is to be congratulated for his courage and compassion to reject this one scientific pre-requiste because so far not more than 14 birds of the discovered species have been spotted. 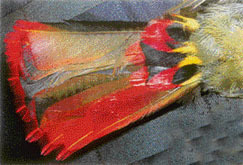 In any case, Ramana has irrefutable photographic evidence, sound recordings of the bird's song on tape, two feathers (one from the tail and another from the wing) and more than a dozen enthusiasts from the US and Europe as witnesses, who per chance happened to be with him on that fateful day. All evidence (of course, minus the witnesses) has been deposited with the Bombay Natural History Society, Mumbai. What about the name of the bird? Well, it has been identified as a species from the Asian Babbler family. For the purpose of international convenience in usage, all birds are given a scientific name (in Latin) and an English (common) name. And, of course, they retain their vernacular (regional) name. 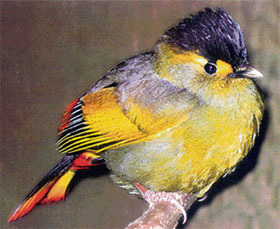 Ramana very promptly named it Bugun Liocichla, which got Latinised as Liocichla Bugunorum. 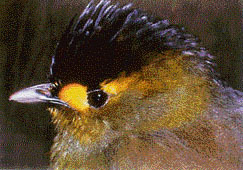 Buguns are the local tribe which cohabit the area with this bird. These tribesmen accompanied Ramana during all his ventures in that area. The name is both a token of Ramana's appreciation to them and the hope of a symbiotic relationship between the Buguns and the Liocichla. For the present the bird has no common or vernacular name but in the fitness of things it would be just appropriate to call it Athreya's Babbler. There are very good reasons to do so. Firstly, there is the universal precedence in ornithology to assign eponyms to birds. For instance we have Jerdon's Double-Banded Courser, after Maj T. C. Jerdon of the Indian Army who had discovered it. To name just one more, we also have Tickell's Blue Flycatcher; Tickell too was from the Indian Army, a Lieutenant Colonel. More than all other considerations, this is the only bird of India's 1,226 species that has been discovered by and whose scientific text has also been written by an Indian, Ramana Athreya. Do we need to labour on this aspect any more? Now what takes Ramana, a graduate from IIT Kanpur (1989), a radio astronomer of international standing, currently on the rolls of the National Centre for Astrophysics on the Pune University Campus, to the Eaglenest in W Kameng? To begin with, it was to spend a short holiday with his wife, who was pursuing a field project in Kameng for her doctoral thesis. Birdwatching has always been a passion but when in January 1995 he first saw a pair of birds all he knew was that "they did not fit any description in S.Ali & S.D. Ripley’s Complete Handbook of the Birds of India and Pakistan (1987)". The next sighting came after 10 long agonising years in January 2005; a flock of six at 3 p.m. and of another four at 3.45 pm. In collaboration with two friends from the Wildlife Institute of India, Dehra Dun, and with permission from the government, they attempted to mist-net a specimen between January 23 and 28, 2005, but did not succeed. He returned to the site in March and April this year and over four different days saw 14 of these birds. On May 21, he attempted and succeeded in mist-netting one bird. Unfortunately, the bird escaped after just three photographs. Ultimately on May 25, Ramana's luck held when he netted one more. Now he created a complete photographic evidence, took bodily measurements with vernier calipers, made detailed notes and in less than two hours released the bird to join its kind. And the discovery became a fact of life from that moment! In 1994, the North-eastern Himalayas were listed among the dozen biodiversity rich hot-spots of global significance. Once Ramana saw the Eaglenest sanctuary, he conceived a project to document its biodiversity, coopt the tribes (Bugun and Sherdukpen) as partners in conservation of biodiversity and in return provide them with alternative socio-economic sustenance such as eco-tourism. Funded by the Ruthford Foundation, the project was launched in November 2003. Birdwatchers from the US and Euorpe proved most eager for recreation of this kind. Ramana has already successfully conducted one such group in collaboration with the locals in 2004 and two in 2006. All proceeds from this eco-tourism venture have gone to the Village Tribal Council, which has pledged to keep the project going. Ramana in the meantime has obtained funds from the Ford Foundation for creating tented accommodation for visiting groups. Indian professional and amateur ornithologists have been offered a "vacation-for-conservation" plan where participants are charged tariff at zero-profit, provided experienced guide gratis and all this is in return for simply documenting the flora and fauna of Eaglenest. 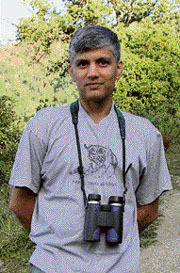 When Ramana Athreya had first seen the Bugun Liocichla in 1995 and then could not spot it till 2005, he "began to doubt what I had seen". And now whole of India sees and rejoices in having a spanking, cuddly new bird, just 2mm bigger than the familiar Red-vented Bulbul.